This article is about the city and unitary authority. For the small town in south west Wales, see Newport, Pembrokeshire. For other uses, see Newport (disambiguation). "Terra Marique" "By land and sea"
In the 20th century, the docks declined in importance, but Newport remained an important manufacturing and engineering centre. It was granted city status in 2002. Newport hosted the Ryder Cup in 2010 and was the venue for the 2014 NATO summit. Bronze Age fishermen settled around the fertile estuary of the River Usk and later the Celtic Silures built hillforts overlooking it. In AD 75, on the very edge of their empire, the Roman legions built a Roman fort at Caerleon to defend the river crossing. According to legend, in the late 5th century Saint Gwynllyw (Woolos), the patron saint of Newport and King of Gwynllwg founded the church which would become Newport Cathedral. 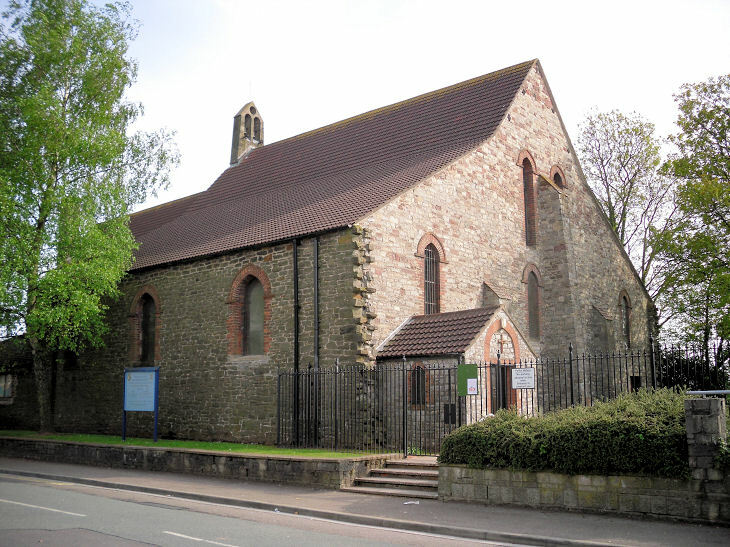 The church was certainly in existence by the 9th century and today has become the seat of the Bishop of Monmouth. 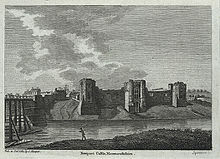 The Normans arrived from around 1088–1093 to build the first Newport Castle and river crossing downstream from Caerleon and the first Norman Lord of Newport was Robert Fitzhamon. 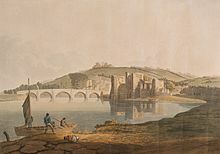 Compared to many Welsh towns, Newport's economy had a broad base, with foundries, engineering works, a cattle market and shops that served much of Monmouthshire. However, the docks were in decline even before the Great Depression, and local unemployment peaked at 34.7% in 1930: high, but not as bad as the levels seen in the mining towns of the South Wales Valleys. Despite the economic conditions, the council re-housed over half the population in the 1920s and 1930s. In 1930 the Town Dock was filled in. 1867: Lower Dock Street drill hall completed. 1887: The Boys' Brigade movement in Wales founded by George Philip Reynolds at Havelock Street Presbyterian Church. 1915: First public automatic telephone exchange made in Britain opens in Newport. 2013: Hartridge High School reopens as Llanwern High School in a new £29m building. 2019: The International Conference Centre (ICC) is set to open at the Celtic Manor Resort. 2019: Railway electrification will reach Newport as part of the 21st-century modernisation of the Great Western main line. Newport has long been the largest town in the historic county of Monmouthshire and a county borough between 1891 and 1974. The Local Government Act 1972 removed ambiguity about the legal status of the area by including the administrative county of Monmouthshire and the county borough of Newport into all acts pertaining to Wales. In 1974, the borough was incorporated into the new local government county of Gwent until Newport became a unitary authority in 1996. Gwent remains in use for ceremonial functions as a preserved county. The city is historically industrialised with a large working-class population and a strong support for the Labour Party. Labour lost control of Newport City council in the 2008 local elections to a Conservative/Liberal Democrat coalition but the Labour Party regained an overall majority of councillors in the 2012 election. The City of Newport is divided between the UK Parliamentary constituencies of Newport West and Newport East and elects one Member of Parliament (MP) in each constituency. The two constituencies cover a similar area to that of the city area controlled by Newport City Council. The city formerly had only one constituency until 1983 when the city was split into Newport West and Newport East due to population growth. In the United Kingdom general election, 2017, Labour held Newport West with an increased majority of 5,658 votes over the Conservative Party. The Labour Party also held Newport East with an increased majority of 8,003 votes over the Conservative Party. 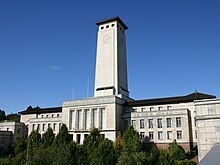 In the National Assembly of Wales Newport is divided into Newport West and Newport East constituencies and elects one Assembly Minister (AM) in each constituency. In the National Assembly for Wales election, 2016, Labour held Newport West with a reduced majority of 4,115 votes over the Conservative Party. The Labour Party also held Newport East with a reduced majority of 4,896 votes over UKIP. Newport is part of the Wales European Parliament Constituency. The Wales constituency elects four Members of the European Parliament (MEP). In the 2014 European Parliament election the Wales constituency elected one MEP from each of the Labour, UKIP, Conservative, and Plaid Cymru parties. The official blazon of the armorial bearings is: "(arms) Or, a chevron reversed gules, the shield ensigned by a cherub proper. Supporters: on the dexter side a winged sea lion Or, and on the sinister side a sea dragon gules, the nether parts of both proper, finned gold." Newport is located 138 miles (222 km) west of London and 12 miles (19 km) east of Cardiff. It is the largest urban area within the historic county boundaries of Monmouthshire and the preserved county of Gwent. The City of Newport, which includes rural areas as well as the built up area, is the seventh most populous unitary authority in Wales. The city is divided into 20 wards. Most of these wards are coterminous with communities (parishes) of the same name. Each community can have an elected council. The following table lists city council wards, communities and associated geographical areas. * communities with a community council. Newport's Travel to Work Area incorporates much of south Monmouthshire; the new 2001-based area also includes Cwmbran. The city itself has three major centres for employment: the city centre, and business parks clustered around the M4 motorway junctions 24 in the east and 28 in the west. Organisations based in the city include Airbus Defence & Space; the headquarters of the Office for National Statistics; the headquarters of the United Kingdom Intellectual Property Office (formerly known as the Patent Office); the General Insurance Division of Lloyds TSB; a large Panasonic manufacturing plant; a manufacturing plant for International Rectifier; the headquarters of insurance comparison site Gocompare; the headquarters of Wales and West Utilities; the shared-service centre for HM Prison Service; the Passport Office for much of the south and west of the UK; and the Wales headquarters of the Charity Commission and British Red Cross. In 2014 Admiral Insurance opened a large newly constructed office opposite Newport railway station. In 1997, Newport secured what was then thought to be Europe's largest-ever inward investment when the LG Group announced a £1.7 billion project creating 6,100 jobs, and supported by public sector grants. Facilities were built on the Celtic Lakes business and science park, but market conditions led to the semiconductor plant never opening, and the CRT plant eventually closed in 2003. In 2005 Irish radiator manufacturer Quinn Group bought the former LG Phillips building, which became its European base. Industry in the east of Newport was formerly based at the Corus Llanwern steelworks, and although the rolling mill is still active, steel manufacture ceased in 2001. Permission has been granted to transform the 600-acre (2.4 km2) former steelworks site into a £1bn mixed-use development comprising housing, office and industrial space, public open space and a range of community facilities. At the mouth of the River Usk, the Sims Metal Management plant hosts the world's largest industrial shredder for scrap metal with access by road, rail and sea. The plant, which is also the world's largest car crusher which was featured in the TV series 'How do they do it'. Newport Cattle Market, in the Pillgwenlly area of the city, closed in 2009 and was demolished to make way for a new supermarket. The city has seen major regeneration projects being undertaken in recent years. The first stage of regeneration involved improving the city centre road network, turning Kingsway and Queensway into boulevards. The Southern Distributor Road to the south of the city opened in 2004, including the new City Bridge over the River Usk, improving access and opening up new areas for development. The Newport City footbridge opened in 2006 linking the east and west banks of the river for pedestrians and cyclists. Newport railway station was expanded in 2007 to four full size platforms capable of receiving 10 car Intercity Express Programme services to and from London Paddington. In 2010 a new station building was finished, carried out by engineering firm Atkins. During construction it was Wales' most environmentally friendly station work, using a hypermodern green ETFE structure similar to the materials used in the Eden Project and the Beijing Olympics’ ‘Water Cube’. In 2019 railway electrification and resigning work will be completed, completing the 21st-century modernisation of the Great Western main line and reducing journey times to London to 1 hour 30 minutes. Newport bus station was redeveloped in 2013, expanded in 2015 with the Friars Walk development, and now offering 24 stands connecting to the rest of the city, as well as Cardiff and Bristol. Local railway stations are reopening, starting with Rogerstone station in 2008, Pye Corner station in 2014, and with three others planned in the city's Unitary Development Plan. Transport for Wales intend to restart services between Newport and Ebbw Vale Parkway by 2021. The Riverfront Arts Centre was the first structure to be built as part of Newport's regeneration by Newport City Council in 2004. It stands on Kingsway Boulevard on the west bank of the River Usk. On the east bank, Rodney Parade is home to club rugby union side Newport RFC, the regional Pro14 rugby union team Dragons, and the football team Newport County A.F.C. As a result of the removal of the Severn Bridge toll, Newport has witnessed the fastest growth in property values in the UK, as residents in expensive areas of Bristol have shifted away from South Gloucestershire. As part of the city's master plan, the city centre has been expanded to take in areas of the River Usk east bank, with the area of land between Newport Bridge and George Street Bridge part of an ongoing a £43 million high-density combined commercial and residential area, joined to the west bank by the new footbridge. The plan is designed to show a strong urban form along the riverfront, emphasised with tall landmark buildings. The first phase has been labelled City Vizion. Adjacent to the University campus on the west bank is "The Edge" development. Initially planned as 227 apartments, including a 21-storey tower, this development did not take place due to the developer's financial situation. In the area is the Newport Student Village, as well as the "Newhaus" development of 154 riverside apartments. At the southern end of the site, the "Alexandra Gate" development includes 300 homes and riverside apartments built adjacent to the City Bridge. The Newport retail environment faced challenges following the late-2000s recession, with major redevelopment projects were heavily delayed. Friars Walk shopping complex was first planned as a £210m development ahead of the 2010 Ryder Cup, but faced numerous setbacks. 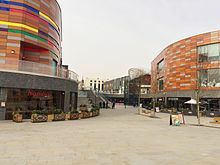 The site opened to the public in November 2015 helped by £90m of assistance from Newport Council to the developers, with the Debenhams flagship store. As well as 30 new shops, there are a dozen restaurants and an eight-screen Cineworld multiplex cinema. 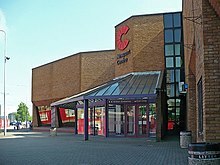 Plans for redevelopment of the smaller Cambrian Centre were approved in 2012. Building on hosting the Ryder Cup in 2010 and the NATO Summit in 2014, the 5,000 capacity Celtic Manor International Conference Centre (ICC) is scheduled to open its doors in July 2019 as a conference venue for businesses and events in Wales and across the South West of England. The 15-storey Chartist Tower is currently being redeveloped by developers Garrison Barclay Estates as a 163-bedroom Mercure Hotel, featuring views across the city and the Bristol Channel. The site will also include 25,000 sq ft of office space and 18,000 sq ft of retail space. Newport Market is also being redeveloped as a £12m mixed use site with a tech hub, apartments, market units, as well as a food court. Newport Bus Station is the largest bus interchange in the county, with 24 stands. Bus services are primarily provided by the council-owned Newport Bus and neighbouring Cardiff Bus. Other operators include FoxStar Bus, Stagecoach in South Wales, New Adventure Travel (N.A.T.). Inter-city National Express services run from a stop near the Riverfront arts centre opposite the bus station and Megabus (Europe) services operate outside of Newport Railway Station. Newport railway station is the third-busiest station in Wales. The station has four full size platforms capable of receiving 10 car Intercity Express Programme services to and from London Paddington, and the current station was built in 2010 in a hypermodern green ETFE structure. It is connected directly to the South Wales Main Line branch of the Great Western Main Line, Welsh Marches Line and Gloucester to Newport Line. Rogerstone railway station on the Ebbw Valley Railway reopened in 2008. Services currently run between Ebbw Vale and Cardiff via Rogerstone. Transport for Wales intend to run direct services between Newport and Ebbw Vale by 2021. Newport railway station underwent a £22 million refurbishment programme, introducing a futuristic new passenger terminal and bridge, whilst restoring the 19th-century features of the site. The new complex, west of the old station entrance, includes two terminals, four full size platforms, new terminal buildings and a public footbridge, a new passenger footbridge, a new taxi area and short-stay car park, and a 250-space passenger car park. The 21st-century modernisation of the Great Western main line programme will see electrification reach Newport and Cardiff Central by 2019, providing emission-free trains as part of the Intercity Express Programme and journey times between Newport and London eventually reduced to around 1 hour 30 minutes. The city has a number of churches of architectural merit. The main shopping streets of Newport city centre are pedestrianised with High Street and Commercial Street forming the north /south axis plus adjoining roads including Newport Arcade, Market Arcade, Skinner Street, Bridge Street, Upper Dock Street, Market Street, Griffin Street, Corn Street, Cambrian Road, Hill Street and Llanarth Street. The five roads of Commercial Street, Stow Hill, Bridge Street, High Street and Skinner Street converge at Westgate Square (named after the Westgate Hotel) and this is generally regarded as the central point the city. Kingsway Shopping Centre is an indoor shopping mall. The adjoining £90 million Friars Walk shopping centre opened in November 2015 is regarded as having benefited the city centre; this has 30 shops, about 12 restaurants and an 8-screen cinema. Newport Market is a Victorian indoor market on two floors with outlets for produce and general products. Newport Retail Park is to the east at Lliswerry – M4 motorway Junction 24 (Coldra), then A48 (Ringland Way/Spytty Road). Three retail parks (Harlech, Maesglas and 28 East) around Maesglas to the west of the city – M4 motorway Junction 28 (Tredegar Park), then A48. 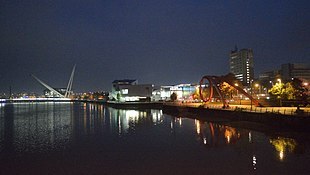 The University of South Wales campus is on the west bank of the river Usk in Newport city centre. The university can trace its roots to the founding of the Newport Mechanics Institute in 1841. Newport School of Art, Media and Design was one of the first Art Schools to be awarded degree status in 1973 and enjoyed a high reputation in painting, Fine Art, and sculpture throughout the 1960s and 1970s. It is still highly regarded however, especially in documentary photography. The Fine Art course closed in 2013, its final degree show entitled 'depARTure'. Newport also has the further-education Coleg Gwent City of Newport Campus, informally known as Nash College, in Lliswerry. Brynglas House is currently an Adult Education Centre. Newport has eight state comprehensive schools (Bassaleg School, Newport High School, St Joseph's Roman Catholic High School, Caerleon Comprehensive School, John Frost School, Lliswerry High School, Llanwern High School and Saint Julian's School) and one independent comprehensive school (Rougemont School). All schools are governed by Newport Local Education Authority. 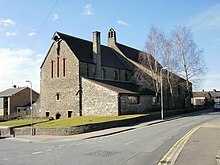 Newport has three Welsh-medium primary schools; Ysgol Gymraeg Bro Teyrnon in Brynglas, Ysgol Gymraeg Casnewydd in Ringland and Ysgol Gymraeg Ifor Hael in Bettws. The Welsh-medium secondary school is Ysgol Gyfun Gwent Is Coed in Brynglas. A Football Academy is based at Llanwern High School. It was established in 1998 as a partnership of Newport County Football Club and Newport City Council. The academy has a development programme of around 50 students undertaking sporting qualifications. The students compete in the South West Counties League as Newport County's youth team. Stand and Stare statue by Paul Bothwell Kincaid, in Commercial Street, commemorating the work of poet W. H. Davies, who was born in Newport and lived his early life there. Davies is best known for his poem Leisure; "What is this life if, full of care, We have no time to stand and stare". Newport Centre and the Riverfront Arts Centre are popular concert venues. Other live music venues in the city centre include NEON, Six Feet Under, Le Pub, Riverside Tavern, Warehouse 54, McCann's and The Potters. Outdoor music events are held in the summer months at Beechwood Park, Belle Vue Park, Rodney Parade, the Pillgwenlly carnival and Maindee carnival. The exploits of Newport RFC are world-renowned. [attribution needed] One of the few clubs to have beaten all the major southern hemisphere touring sides, they were the only side to beat the Invincible All Blacks of 1963–64. Amongst the names associated with the club are Arthur 'Monkey' Gould, the first rugby union superstar, and David Watkins, the only man to have captained Great Britain at rugby union and rugby league. Since the regionalisation of Welsh club rugby in 2003, Newport RFC play in the Welsh Premier Division and operate as a feeder club to the Dragons regional team who play in the Pro14. Both Newport RFC and the Dragons play at Rodney Parade near Newport city centre. Nine other rugby union teams playing in the Welsh League are based in Newport; Newport Saracens, Pill Harriers, Newport High School Old Boys, Bettws, Caerleon, Hartridge, Rogerstone, St Julians High School Old Boys and Whiteheads. Newport's rugby league club are called the Newport Titans and play in the Welsh Conference Premier. Newport's best known association football club is Newport County, who were formed in 1912 and joined the English Football League in 1920. Newport County have played in the second tier of English football and spent over 60 seasons in the Football League, reached the last 16 of the FA Cup, won the Welsh Cup in 1980 and subsequently reached the quarter-finals of the European Cup Winners' Cup in 1981. They were relegated from the Football League in 1988 and went bankrupt the following year. The club re-formed in 1989, and secured promotion back to the Football League for the 2013–14 season after a 25-year absence, and now play in Football League Two. In the 2010s, the club has enjoyed widespread success under local and club legend Michael Flynn in the FA Cup. In 2017-18 the team beat Leeds United F.C. and drew against Tottenham Hotspur F.C. In 2018-19 the team reached the Fifth Round of the tournament for only the second time in their history, securing a lucrative fixture at Rodney Parade against 2018 Premier League champions Manchester City F.C. Newport is also home to five teams that play in the Welsh Football League: Caerleon, Lliswerry, Newport City, Newport Civil Service and Newport YMCA,. The city has its own league, the Newport and District Football League, which is part of the Welsh football league system and consequently some Newport clubs field teams in the Gwent County League. Lovell's Athletic were a fairly well known team in the mid-20th century – due to the suspension of League football during the Second World War they were the premier team in the city, as Newport County did not field a side. During this period they managed to reach the 3rd round of the FA Cup in the 1945–46 season. Dragon Park, the Football Association of Wales' National Football Centre, is located at the Newport International Sports Village. The centre also provides the headquarters for the Welsh Football Trust. The city is home to the Celtic Manor Resort, a five-star conference resort and home of the Wales Open, the annual European Tour golf tournament. The resort was the venue for the All*Star Cup celebrity golf tournament in 2005 and for the 2010 Ryder Cup. The city has high-quality golf facilities at Llanwern Golf Club, Peterstone Golf Club, Parc Golf Academy in Coedkernew and Newport Golf Club and Tredegar Park Golf Club in Rogerstone. Caerleon has a good quality nine-hole municipal course, driving range and clubhouse. Within a short drive of Newport are golf clubs at St Mellons, Dewstow, Shirenewton, St Pierre, GreenMeadow, Woodlake, Alice Springs, Pontypool and Raglan. The Newport International Sports Village at Lliswerry includes the Wales National Velodrome, the head office of Welsh Cycling. Newport was a key venue for British Tennis. The 'World Group' Ties for the 1906 International Lawn Tennis Challenge (forerunner to the Davis Cup) were hosted at Newport Athletic Club. The Newport International Sports Village has been home to Newport Cricket Club since moving from Rodney Parade in 1990. For many years the city had a motorcycle speedway team Newport Wasps but the team was disbanded in 2012. Newport is one of three main cities where British baseball is still played – the others are Cardiff and Liverpool – and the city hosts a international match every four years at Coronation Park. South East Wales Regional Swimming Pool is located at Newport International Sports Village. Newport Tennis Centre is also located at the complex and is a municipal multi-sport facility for tennis (indoor and outdoor), five–a-side football, basketball, hockey, netball, table tennis, badminton and squash. Newport Squash Club has four courts situated in the grounds of Rodney Parade and the club operates a public pay-per-play arrangement there. St. Joseph's Amateur Boxing Club is situated on George Street and is the home club of Yemeni-born 2006 Commonwealth bronze medallist Mo Nasir and 2010 Commonwealth Silver medallist Sean McGoldrick. Treetops Shooting Ground, Coedkernew is one of Britain's best equipped Clay pigeon shooting grounds and often hosts competitions between local shooting clubs and University clay shooting clubs from around South Wales and South West England. Newport hosted the International Cross Country Championships (1903-1972) on six occasions (1906, 1911, 1921, 1927, 1933 and 1955) at Caerleon Racecourse. Newport has a Skittle Alley League consisting of over 50 teams who play their league games on a Friday evening. Newport's local newspaper is the South Wales Argus, which is published in the city and distributed throughout the city and surrounding area. Local analogue radio broadcasting licences cover the Cardiff/Newport area; the FM licence is held by Cardiff Broadcasting Co. Ltd., broadcasting as Capital FM South Wales from Cardiff Bay and the AM licence is held by Capital Radio plc, broadcasting as Capital Gold. The local DAB ensembles are Cardiff and Newport (11C) and South Wales and Severn Estuary (12C). Newport has several internet radio stations, the most popular of which is Newport City Radio. ^ a b c d e f g h i j k l m n o The Welsh Academy Encyclopedia of Wales. Cardiff: University of Wales Press 2008. ^ Archæologia Cambrensis. Cambrian Archæological Association, 1859. Retrieved 27 September 2007. ^ "A Summary of the Early History of Newport". Bob Trett, newportpast.com. Retrieved 1 October 2007. ^ Bradney, Joseph Alfred (1993). Gray, Madeleine (ed.). A History of Monmouthshire, Volume 5: The Hundred of Newport. South Wales Record Society. p. 23. ISBN 0950867675. Retrieved 9 May 2013. ^ a b "A Brief History of Newport". Tim Lambert. Retrieved 9 October 2008. ^ "Owain Glyndwr, The Bell at Caerleon". The Bull Inn, Caerleon, June 2007. Retrieved 9 October 2008. ^ a b Hando, Frederick James (1958). Out and About in Monmouthshire. Newport: R. H. Johns. ^ "Newport: the Tom Toya Lewis". Geograph.org.uk. Retrieved 22 January 2013. ^ "Newport: foundation stone of YMCA in Commercial Street". Geograph.org.uk. Retrieved 22 January 2013. ^ "When steamers sailed into the heart of Newport". South Wales Argus. Retrieved 17 March 2019. ^ "The Motorway Archive: The M4 in Wales". Ukmotorwayarchive.org. Retrieved 22 January 2013. ^ "The Inmos Legacy". Inmos.com. Retrieved 22 January 2013. ^ "''Real Newport'', Seren Books". Seren-books.com. Retrieved 22 January 2013. ^ "Newport". The Drill Hall Project. Retrieved 21 August 2017. ^ "Newport Transporter Bridge". Geograph.org.uk. Retrieved 22 January 2013. ^ "HISTORY OF AUTOMATIC TELEPHONY". www.britishtelephones.com. Retrieved 17 March 2019. ^ "NATO summit coming to Newport's Celtic Manor". South Wales Argus. 31 October 2013. ^ a b Mills, Hayley (17 August 2013). "Newport County awarded Freedom of the City". South Wales Argus. Retrieved 7 October 2013. ^ "Field Marshal Montgomery is awarded the Freedom of Newport, 29 September 1945 (photograph)". People's Collection Wales. Retrieved 7 October 2013. ^ "Newport City: HMS Severn". Newport City Council. Retrieved 7 October 2013. ^ "Newport County awarded Freedom of the City". South Wales Argus. 17 August 2013. Retrieved 7 October 2013. ^ "Newport rugby freedom presentation". Newport City Council. Retrieved 31 October 2013. ^ "Mean July temperature in the UK". The Met Office. Retrieved 8 October 2007. ^ "Mean July rainfall in the UK". The Met Office. Retrieved 8 October 2007. ^ "Mean January temperature in the UK". The Met Office. Retrieved 8 October 2007. ^ "Mean January rainfall in the UK". The Met Office. Retrieved 8 October 2007. ^ "Average annual sunshine totals in the UK". The Met Office. Retrieved 8 October 2007. ^ "The coldest days of each year in the UK". T.A. Harley. Archived from the original on 25 March 2007. Retrieved 30 December 2006. ^ Statistics, Neighbourhood. "2011 Census: Newport Ethnicity". 2011 Census Key Statistics. ONS (Office for National Statistics). Retrieved 3 February 2013. 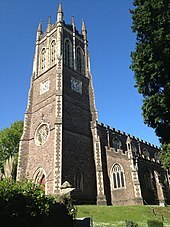 ^ "Diocese of Monmouth – Newport Cathedral". Church in Wales. ^ "Local statistics - Office for National Statistics". www.ons.gov.uk. Retrieved 17 March 2019. ^ "Established Christian churches in Newport". Churches Together Newport. Retrieved 26 September 2006. ^ "Mosques in Newport". New Muslim Network. Archived from the original on 29 June 2006. Retrieved 27 August 2006. ^ "Synagogues in Newport". JewishGen. Retrieved 26 September 2006. 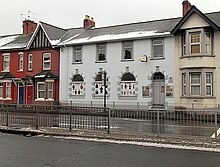 ^ "Gurudwara near Newport". AllAboutSikhs.com. Archived from the original on 7 May 2006. Retrieved 26 September 2006. ^ "St Julians Church by Olive M Ellis from Gwent Local History". www.caerleon.net. Retrieved 17 March 2019. ^ "LG Group makes Europe's biggest inward investment". Prnewswire.co.uk. Retrieved 22 January 2013. ^ "Wales | LG: The dream that died". BBC News. 22 May 2003. Retrieved 22 January 2013. ^ "Newport City Council press release – Quinn Group move provides 465 new jobs for Newport". Newport.gov.uk. Retrieved 22 January 2013. ^ "Newport – City Centre Redvelopment – Eastern Newport". Newport.gov.uk. Retrieved 22 January 2013. ^ Sims UK opens multi-million pound metals recycling terminal LetsRecycle, 17 November 2004. Retrieved 3 June 2010. ^ Newport Hosts one of Europe's largest recycling facilities Archived 17 October 2008 at the Wayback Machine Materials Network Wales, Summer 2006. Retrieved 3 June 2010. ^ Powering the World’s largest Industrial Shredder weg.net, 30 September 2009. Retrieved 3 June 2010. ^ Man Made: World's biggest shredder Archived 16 March 2010 at the Wayback Machine National Geographic Channel. Retrieved 3 June 2010. ^ "Car-Crushing Giant Starts Up". BBC News. 17 November 2004. Retrieved 22 January 2013. ^ "NEW PLATFORM FOR NEWPORT STATION". Network Rail Media Centre. Retrieved 19 February 2019. ^ "Newport Station: Gateway to Wales". www.atkinsglobal.com. Retrieved 19 February 2019. ^ "Start of works on Kingsway Centre". ^ "Newport Unitary Development Plan" (PDF). Newport City Council. Archived from the original (PDF) on 23 July 2006. Retrieved 30 August 2006. ^ "Major improvements to rail promised with services to benefit from £5bn investment - including Newport-Ebbw Vale link". South Wales Argus. Retrieved 19 February 2019. ^ ""Newport in Wales saw biggest jump in house prices in the UK in 2018"". Property Wire. 15 February 2019. Retrieved 19 February 2019. ^ "Rodney Parade Supplementary Planning Guidance" (PDF). Newport City Council. Archived from the original (PDF) on 30 June 2007. Retrieved 20 July 2006. ^ "City Vizion". Taylor Wimpey plc. Retrieved 30 August 2007. ^ ""Student accommodation in Newport"". Campus Living Villages. Retrieved 19 February 2019. ^ "Newhaus Riverside Apartments, Newport". Westmark. Archived from the original on 8 March 2008. Retrieved 2 October 2007. ^ "Alexandra Gate, Newport". Redrow Homes (South Wales) Ltd. Archived from the original on 15 September 2007. Retrieved 2 October 2007. ^ "Llanwern regeneration". St. Modwen Developments LTD. Retrieved 30 August 2006. ^ a b c d BBC News, Newport's £90m Friars Walk shopping complex opens, 12 November 2015. ^ Nick Servini (19 April 2012). "Friars walk relaunch". Bbc.co.uk. Retrieved 22 January 2013. ^ "Cambrian Centre redevelopment". Southwalesargus.co.uk. 18 April 2012. Retrieved 22 January 2013. ^ "Newport's £84m convention centre well on course for July 2019 opening". South Wales Argus. Retrieved 19 February 2019. ^ "Council gives backing to next stage of £12 million revamp for market plan". South Wales Argus. Retrieved 19 February 2019. ^ "Train Info – Plusbus" (PDF). Ptsllibrary.co.uk. Archived from the original (PDF) on 23 February 2012. Retrieved 22 January 2013. ^ ST3188 : Newport Bus Station has been now been redeveloped. National Express operate cross-country coach services from the city. ^ "GET US BACK ON TRACK: Full details of new rail contract - including restoration of Newport-Ebbw Vale link - revealed". South Wales Argus. Retrieved 19 February 2019. ^ Barry, Sion (5 April 2017). "How electrification will reduce journey times between South Wales and London". walesonline. Retrieved 19 February 2019. ^ "Newport – host city to the 2010 Ryder Cup". Newport.gov.uk. Retrieved 22 January 2013. ^ "Wales | New £2bn airport plan dropped". BBC News. 16 December 2003. Retrieved 22 January 2013. ^ "900 year old church in Nash". Southwalesargus.co.uk. 6 August 2010. Retrieved 22 January 2013. ^ "Lysaght Institute". www.lysaght-institute.com. Retrieved 17 March 2019. ^ "Newport: The city that's forever on the up but never quite gets there". Wales Online. 8 April 2018. Retrieved 6 May 2018. ^ "painting". Amd.newport.ac.uk. Archived from the original on 1 September 2010. Retrieved 23 January 2013. ^ a b "Film, Photography and Digital Media". Amd.newport.ac.uk. Archived from the original on 1 September 2010. Retrieved 23 January 2013. ^ "Film, Photography and Digital Media". Amd.newport.ac.uk. Archived from the original on 26 August 2009. Retrieved 23 January 2013. ^ "Newport state of mind: last ever degree show as BA Fine Art course closes". Art News. 11 June 2013. Retrieved 8 October 2013. ^ Hood, Harvey (23 November 2011). "Harvey Hood: Archform - Newport Railway Station". Retrieved 17 March 2019. ^ "Newport Festival website". Newport.gov.uk. Retrieved 22 January 2013. ^ "Tredegar House: A brief history of the building". Newport City Council. Retrieved 24 February 2011. ^ "UPDATED: Michael Sheen to help found Chartist trust in Newport". South Wales Argus. Retrieved 17 March 2019. ^ "Newport Chartist mural body wants project manager". South Wales Argus. Retrieved 17 March 2019. ^ "Tightrope walker Olivier Roustan 250ft above Newport". BBC News. 31 August 2010. Retrieved 9 May 2013. ^ "Newport SuperDragons". Archived from the original on 24 January 2010. Retrieved 28 January 2011. ^ "Facebook - Log In or Sign Up". Facebook. Retrieved 17 March 2019. ^ "Alarm at plans to close Newport Museum and Art gallery". South Wales Argus. Retrieved 17 March 2019. ^ "Newport venue TJ's to close". NME. 20 April 2010. Retrieved 22 January 2013. ^ Mansfield, Ruth (15 March 2010). "Owner of legendary TJs – John Sicolo – dies". South Wales Argus. Retrieved 23 October 2010. ^ "Newport (Ymerodraeth State of Mind)". YouTube. 12 August 2010. Retrieved 9 May 2013. ^ "Spoof 'Newport State of Mind' video becomes web hit". BBC News. 24 July 2010. Retrieved 9 May 2013. ^ "Newport State of Mind removed amid copyright claim". BBC South East Wales. 10 August 2010. Retrieved 9 May 2013. ^ Bloxham, Andy (11 August 2010). "Newport State of Mind parody removed over copyright issues". Daily Telegraph. Retrieved 9 May 2013. ^ "Goldie Lookin Chain respond to spoof Newport video". BBC South East Wales. 9 August 2010. Retrieved 9 May 2013. ^ Dennis Havard (21 July 2007). "Newport Male Choir". Homepage.ntlworld.com. Archived from the original on 25 October 2012. Retrieved 22 January 2013. ^ "RSPB Newport Wetlands Reserve". Rspb.org.uk. Retrieved 22 January 2013. ^ "Caerleon cycle path extension". Southwalesargus.co.uk. 9 June 2011. Retrieved 22 January 2013. ^ "east bank walkway completed". Southwalesargus.co.uk. 29 October 2011. Retrieved 22 January 2013. ^ "Newport District Scouts". newportscouts.org. 2013. Retrieved 13 August 2013. ^ Boxing discipline aids drug fight , news.bbc.co.uk, 31 May 2008. Retrieved 21 December 2010. ^ "Sean McGoldrick at Commonwealth games". Southwalesargus.co.uk. 14 October 2010. Retrieved 22 January 2013. ^ "South Wales Argus". South Wales Argus. Retrieved 22 January 2013. ^ "Radio Authority renews local licences for Cardiff/Newport". Ofcom.org.uk. Retrieved 22 January 2013. ^ "newportcityradio.org". newportcityradio.org. 24 May 2012. Retrieved 22 January 2013. ^ "Town twinning". Newport City Council. Retrieved 27 August 2006. 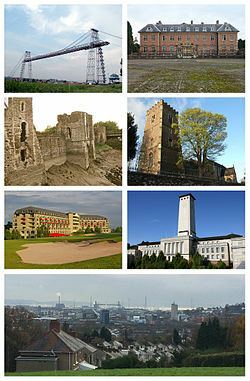 Wikimedia Commons has media related to Newport. Wikivoyage has a travel guide for Newport.